Today we are showing sneak peeks from the upcoming Annual Catalog, which starts in a little over a week! 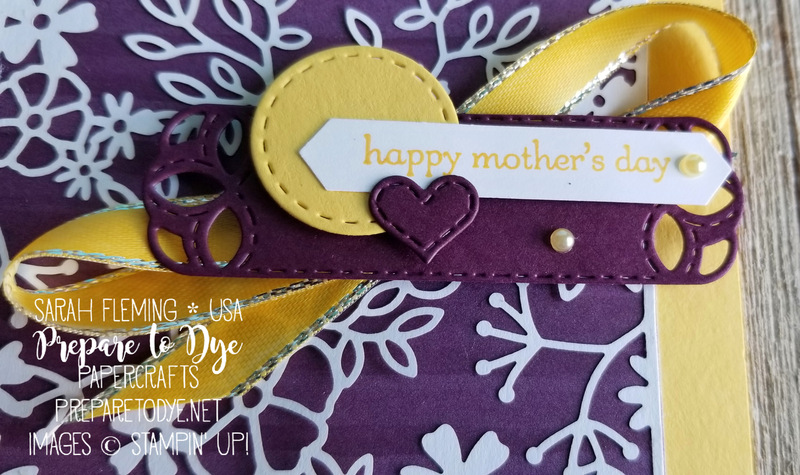 I am showing you the card I made for my mother-in-law for Mother’s Day. 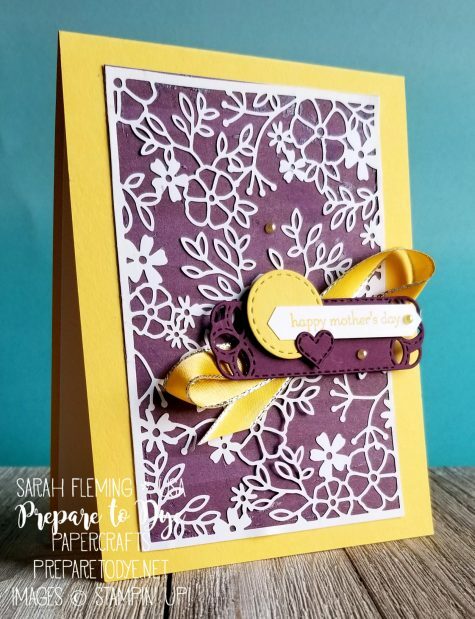 Yellow is her favorite color, so I started with a Daffodil Delight card base. The purple (Blackberry Bliss, to be exact) background paper is from the new Nature’s Roots paper, and the fabulously intricate white floral lace overlay is from the Delightfully Detailed laser-cut paper. This paper is so stunning, and all you have to do is cut it out! The focal point is a little collage I made using the Stitched Labels framelits, Classic Label punch, and Teeny Tiny Wishes stamp set (this set is retiring after so many years!). 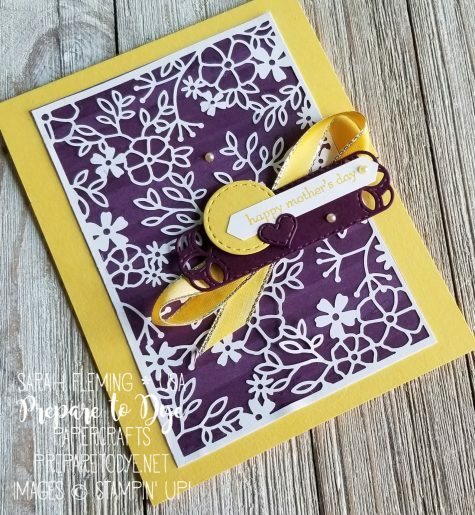 The ribbon is the Silver Stitched-Edge ribbon, colored with a Dark Daffodil Delight Blends marker. Close-up of the focal point (you may have to click to see it). Inside I stamped a sentiment from the new Stitched All Around stamps. 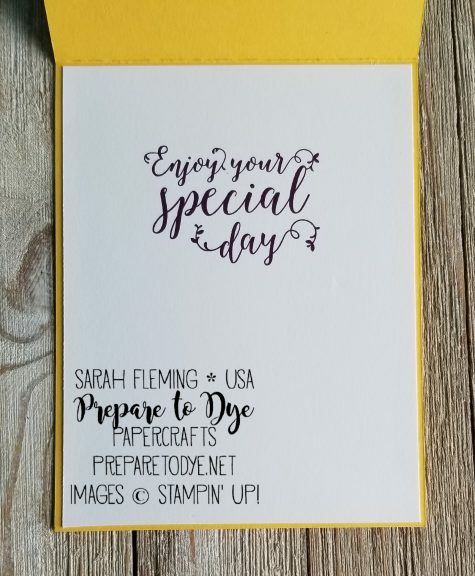 Some things I used on my card can be found in my online Stampin’ Up! store, and the rest will be available June 2nd. 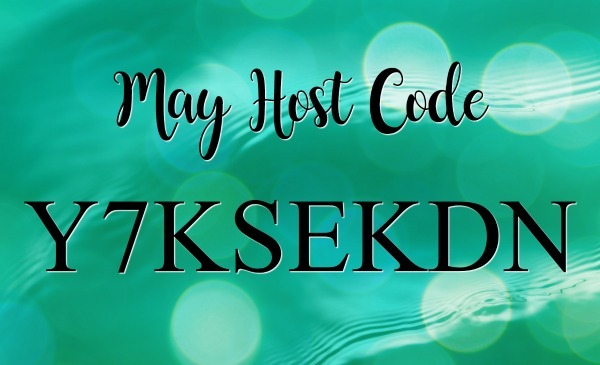 Make sure to use the May Host Code (below) if your order is below $150, and I’ll send you extra goodies! If your order is over $150, make sure to claim your Stampin’ Rewards when you check out, and you’ll still get my free gift! Holy WOW! This is amaze balls, I adore yellow too 😍 that laser cut paper is gorgeous and I loooove your cluster with the sentiment!!! 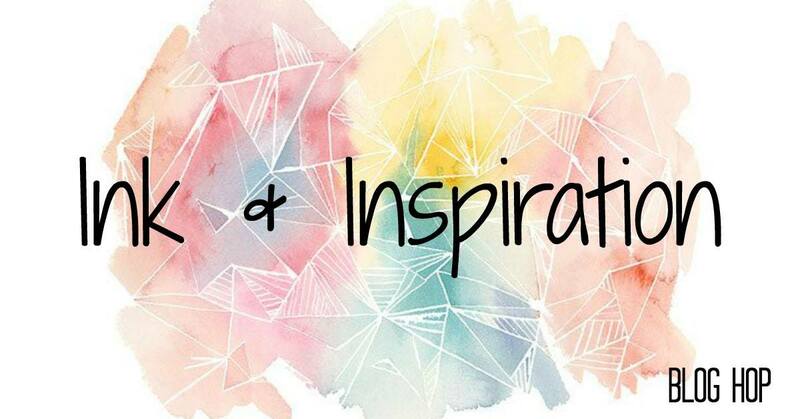 Love the color combo and your card is so pretty,.